As you may be aware, I have a teenage son. He likes MEAT and STARCH. So how am I to get some vegetables in his diet? SALSA! Salsa is a wonderful thing, because you can make it out of anything. You can make it mild, med-hot or super-hot. All depends on your tastes.. but the key here is it’s all veggies. I don’t follow a recipe, I follow what is in my fridge or garden. Toss with corn – and sauté for a 1 – 2 minutes makes a great side dish – who doesn’t eat corn? Tacos? 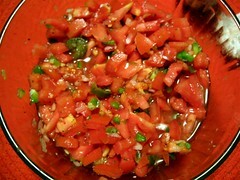 Soft or hard shell or salad..
Salsa has so many applications I am not even beginning to list them all. But one thing is for sure… some chips and salsa, my son eats his veggies and I feel good. Its easy – can be time-consuming, as the smaller the dice and ratio to tomatoes and onions, the better integrated and less noticeable. I prefer hand diced, or mandolin diced, or other methods for dicing as it just looks, tastes and feels better. But to each his own. if you want quick – go ahead and puree, or pulse away. The ratio of other ingredients to the core ingredients is somewhat important. If you have two cups of a tomato and onion mixture, you should not put more than 2 cups of other ingredients. The tomato and onion mixture I find best if 1/2 and 1/2. I like fresh sweet white onions. Since originally posting this entry, I have found a few other spices I have been using that I find makes a big difference in flavor for the vegetable only salsas. 1/2 tsp celery salt, 1 tsp ground cumin, 1/2 tsp ground cardamon. These amounts are for the recipe quantities listed above. Posted by culinaryease on August 14, 2011 in Cooking for two or less, General Cooking, Recipes, Vegan/Vegetarian and tagged Chili pepper, Cucumber, Home, Olive oil, PostaWeek2011, Salad, salsa, Tomato. You can also make a big batch of salsa and freeze. Mind you when you defrost, the veggies won’t be as crisp, but that is ok. You may want to puree the defrosted salsa. Its still veggies. It can also be used as a base for a good vegetable hot soup – just add chicken stock and simmer.. TASTE and adjust seasoning. Or top on toasted baguette rounds for a “bruchetta” type appetizer for a party. One last note – if you don’t have time to make a fresh salsa, the super markets now sell fresh salsa in the salad section. It is very good and no problem using it. You can also use it as a base then add other fresh veggies to it. http://www.wisegeek.com/what-is-jicama.htm will give a full explanation of jicama. In my words – it resembles a white root vegetable on the outside, but the consistency and flavor of a mild apple. Not so sweet or tart, but gives good texture and flavor to raw dishes. If you want to cook it, i would only lightly saute it or can be used in stews or soups similar to a potato. When sliced thin, shredded or julianned, it is a great addition to salads and gives a great crunch.